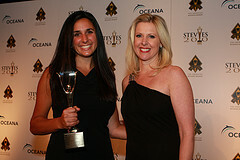 We've just published a new tipsheet called 10 Tips for Winning PR Awards in the 2011 Stevie Awards. Get it here. It summarizes the 10 best ways that public relations and communications professionals can be recognized in the four Stevie Awards competitions in 2011 (which include The American Business Awards, the International Business Awards, the Stevie Awards for Women in Business, and the Stevie Awards for Sales & Customer Service). For the most part it recommends the public relations awards, web awards, and other categories that PR folks should focus on, and outlines the general submission requirements for those categories. 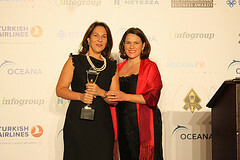 Coca-Cola HBC Romania, Bucharest, Romania was presented with the Stevie Award for Public Affairs Communications or PR Campaign of the Year, in the PR awards categories at The 2010 International Business Awards banquet in Istanbul on September 27. When Romania became a member of the European Community in 2007, EU legislation required that Romania increase its waste recovery to 60% by 2013. The main challenges for the country to reach this target were the lack of an integrated waste-management system with appropriate legislation—and the need to educate the population on separate collection. Coca-Cola HBC Romania, part of the Coca-Cola Hellenic Group, took a leading role in Romania’s efforts to build an integrated system to recover packaging and to provide an awareness campaign for the general population. Separate collection and recycling represent the main sustainability directions of the company. Coca-Cola HBC Romania’s Community Programs team, led by Laura Sgarcitu, an experienced Public Affairs & Communications Specialist, had three objectives: to promote a legislative framework to support a waste management system; to make a significant contribution to attaining the national target set by the EU; and to promote the importance of separate collection and recycling at a national level. A 2008 study carried out by the Institute of Marketing and Surveys in Romania (IMAS) had revealed that only half the Romanian population collected separately. In 2009, the Community Programs team at Coca-Cola HBC developed a platform on separate collection, the two major components of which were a lobbying program aimed at outlining a legislative framework for separate collection in Romania, and an educational campaign targeting the public. In 2010 we introduced a lot of new public relations and communications awards categories in The American Business Awards, and we haven't added any new ones for 2011. But I thought I'd take a moment here to outline the categories that I think are the best fit for public relations, corporate communications, public affairs, and investor relations professionals, because not all of them are plainly labelled. e. Low Budget (under $10,000): campaigns/programs that cost no more than $10,000 to plan and implement. C07. Communications Professional of the Year (for non-executive communications, PR, and IR professionals). This category has no entry fee. a. An essay or case of up to 500 words about the achievements of the nominee since January 1 2010. Depending on the category the nominee can be an entire department, a team, an individual, or the performance of a campaign or program. b. A set of links to online work samples, news articles, press releases, videos, images, etc. that support the nomination. This is optional but highly recommended. You can provide as many links as you'd like, but up to 20 is optimal. c. A brief biography of up to 100 words about the nominee or the leader of the nominated department, team, or campaign/program initiative. As always we welcome your comments and questions about these categories and how to enter. There are a number of other ABA categories that should be of interest to communications professionals, including many of the corporate literature and annual report awards categories, web site and blog awards categories, video awards categories, and live event awards categories. I recommend that you take a look at these as well.